Stream anime episodes for free, you want to Watch Fairy Tail Episode 57 English Subbed online for free. Episode guide Fairy Tail Episode 57 English Subbed Darkness Jura starts a battle with Hot Eye of the Heavenly Eye, and Wendy wakes up and heals Erza. Meanwhile, Cobra follows Jellal, being unable to read his mind, to see that Jellal finds Nirvana. Natsu runs off to find Jellal, determined to not let him meet Erza. 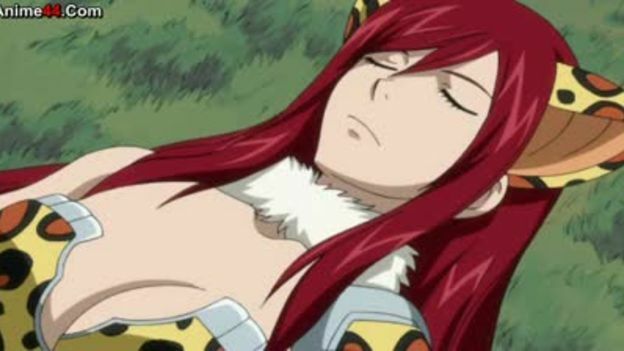 Erza hears the name “Jellal” and sets off by herself without the others knowing. Racer’s personal guild, Harpyia, tries to stop Natsu, but is easily defeated. Hibiki explains about the power of Nirvana – the people in between the power of light and darkness switch to the opposite element. The people of light who feel powerful negative emotion fall into darkness. Fearing that Wendy, who blames herself for reviving Jellal, would fall into darkness as well, Hibiki knocks her unconcious. Meanwhile, Sherry, who feels that Gray has caused Lyon’s death, has fallen into darkness, and knocks Gray unconscious. Hot Eye is also affected by Nirvana, and teams up with Jura. Ren heads toward the light, but Midnight, who begins to hunt the magicians, gets Eve as his first victim.